Dr. Shouka is the clinic director at ChiroActive Therapy and has established the treatment protocols for our facility. He had graduated with honors from Southern California University of Health Sciences in 1988. He was the first chiropractic student ever published in the prestigious “Spine” Journal. 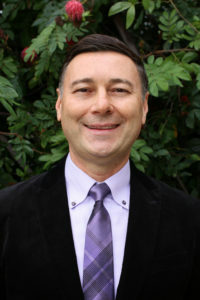 He has been the team chiropractor for the Los Angeles Sparks since 2010. Dr. Shouka has a 5th degree black belt and has attained a Master Level in the martial art known as Hapkido. He was a competitive swimmer and had taught swimming at all levels from babies to seniors to competitive swimmers. Teaching these sports requires a deep understanding of biomechanics that has contributed to the unique treatments developed at ChiroActive Therapy. As an expert in TMJ disorders and craniofacial pain, Dr. Shouka volunteers his time at The White Memorial Hospital Craniofacial Pain Clinic. Dr. Shouka believes that a complete understanding of movement patterns and postural distortions is essential to healing and sustained relief. It’s all about timing and execution. There is a time and place for everything. Recognizing when to implement a therapy is critical to the outcome of the condition. Restoring function is the key to regaining health and mobility. Correcting movement patterns is a big part of our treatments. Once we are moving correctly our joints can heal. To educate people in the principles of muscle therapy and the effects it has on body mechanics. To understand the resultant nerve irritation, weakness, and joint damage. To offer a tangible and realistic solution for neck and back disc degeneration, headaches, and various chronic pain conditions. ChiroActiveTherapy is the combination of active therapy movements, stretches, and exercises with scientific chiro and body mechanics. SOS–Shouka Ortho Spinology is a hands-on treatment approach that realigns the whole body through pressure and stretching. Plastic deformation is corrected with a slow and constant pressure that carefully guides the body into correct posture. Tight muscles are released to allow the agonist/antagonist muscle system to reset thereby creating strength, balance and coordination. ATP- Active Therapy Protocols or ATP are a series of exercises that are designed to restore normal movement patterns in your body. This results in better strength, balance, flexibility and coordination. ATP resolves areas of the body that get weak and move excessively (hypermobile) and other areas that get tight and stiff (hypomobile). Call, get evaluated, look at your options, make a commitment, and never look back! You don’t have to endure all the persistent, excruciating pain. Start your treatment TODAY with trusted professional chiropractor Dr. Shouka at ChiroActive Therapy And Massage. Welcome to chiroactive therapy home of the best chiropractor in Tustin. We are located close to the City of Irvine we might as well be an Irvine chiropractor office. We are a chiropractor office that is conveniently located near Costa Mesa. If you are looking for a chiropractor in Orange you will find our location convenient as well. Call 714-535-6535 for quality massage therapy in Tustin. Irvine residents appreciate our quality massage therapist. If you are looking for Quality massage therapy near Costa Mesa give us a call. We are near Orange for your stress relief massage therapy. Combining Chiropractic massage with exercise has proven very effective for student-athletes. Tustin high school students have found our location convenient and our chiropractor and Sports therapy effective for their sports injuries. Orange Coast College in Costa Mesa and Santa Ana College athletes can benefit from chiropractic and massage Sports Therapy. Student-athletes that attend UC Irvine or Irvine Valley College will get a competitive advantage by having our Sports Therapy. Come to chiroactive therapy in Tustin for your sports injuries and get the Competitive Edge that you need. Soccer players in Tustin Orange Santa Ana Irvine Anaheim Costa Mesa will find the sports injury treatments very effective. Chiropractic therapy is very effective for sports injury therapy for patient from Orange. Sports injury therapy in Tustin is convenient and effective. Sports injury therapy for Irvine patient was very helpful. Costa Mesa athletes found sports injury therapy effective. Orange athletes would benefit greatly with sports injury therapy and chiropractic therapy in Tustin. Chiropractic therapy for Irvine athletes improves coordination and strength. Costa Mesa athletes get results with chiropractic therapy. Chiropractic therapy gives competitive advantage to Orange athletes. Tustin chiropractic therapy is available at ChiroActiveTherapy. Get back pain relief in Tustin with reliable treatments. Chiroactive therapy is an excellent resource for back pain relief for Irvine residents. Orange residents will find chiroactive therapy very effective for back pain relief. If you live in Costa Mesa and you need back pain relief come visit us. For those that need neck pain relief in Tustin we are your number one choice. We are conveniently located next to Irvine for neck pain relief. If you need neck pain relief and you live in Orange we are nearby. Students that are attending colleges in Costa Mesa or Santa Ana or Irvine will find neck pain relief by visiting us. We provide great headache treatment in Tustin. We have great headache treatment for Irvine. Natural headache treatment for Orange. Headache treatment for Costa Mesa is convenient and effective. We are a great resource and treatment option for vertigo treatment in Tustin, vertigo treatment in Irvine, vertigo treatment in Orange, and vertigo treatment in Costa Mesa. We have chiropractic TMJ treatment in Tustin, natural and safe TMJ treatment for Irvine, TMJ treatment for Orange and TMJ treatment for Costa Mesa. Call us for deep tissue massage serving Tustin, Irvine, Orange, Costa Mesa. We are your place for quality sports massage in Tustin Irvine Costa Mesa Orange areas. Relaxation massage at our facility in Tustin is great for stress reduction and pain relief. Swedish massage and stress massage are another way of saying relaxation massage. We are providing quality Swedish massage, stress massage, and relaxation massage for Irvine, Tustin, Orange, Santa Ana and Costa Mesa.